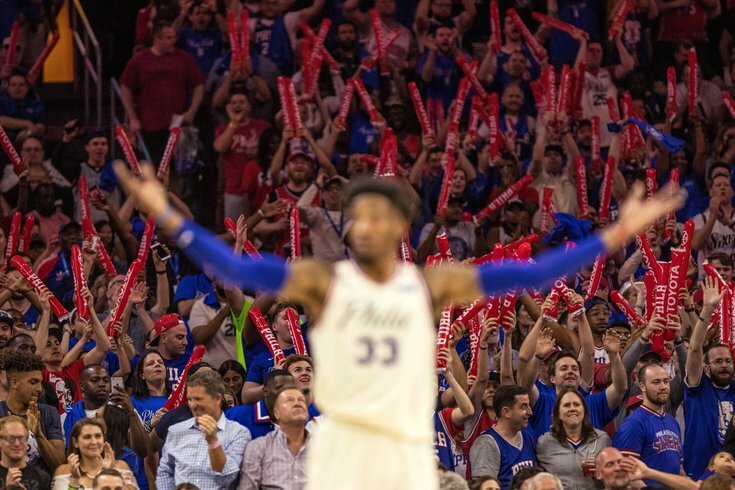 Fans cheer on behind the raised arms of Philadelphia 76ers forward Robert Covington during the fourth quarter of their Game 1 win over the Miami Heat. Sixty-seven years ago, I arrived in this world two weeks later than expected. It was the last time I have shown any patience. That’s why, even now, during this rebirth of the 76ers, I am puzzled and frustrated by the no-timetable approach of our Philadelphia sports teams, and the growing acceptance of this slow-build style by our fans. For example, the Sixers are a revelation in the NBA this year, a franchise that won less than 20 games three straight seasons and then only 28 last year. Suddenly, there is talk of an imminent NBA championship, understandable after the 16-win streak that ended the regular season and the 27-point rout of Miami in the playoff opener. Having never been a fan of The Process, nor its architect, Sam Hinkie, I remain singularly unimpressed. Yes, the Sixers are a thrilling team now, but did anyone bother to count how many days there were between playoff games in Philadelphia? I did. It was 2,150 days – five years, 10 months and 20 days. Is anything in sports worth nearly six years of our patience? What is so brilliant about a plan that required losing 73 percent of the games for five miserable seasons? Is this the new model for rebuilding – long periods of futility followed by a burst of success? Since I already revealed my age at the top of this column, I would be foolish to ignore the notion that with age comes restlessness. I can’t help thinking about the Eagles fans who waited decade after decade for a Super Bowl championship and couldn’t make it until the parade last February. The Eagles decided last year at this time to abandon patience and try to win, signing half a dozen veterans to lead the kids through the big games. They got tired of waiting, and we were all the benefactors of this sudden change of course. But their success has had no effect on the other teams. The Sixers, who are building around superstars Joel Embiid and Ben Simmons, still cringe at the suggestion of a timetable. Heck, they still claim to have no plan for Embiid’s return from a fractured orbital bone. They never have a plan, it seems – or at least one they’re willing to share. The Phillies are an even bigger test of their fans’ patience. They also have two major building blocks to success – Rhys Hoskins and Scott Kingery – but they keep fending off any hint of a timetable. Oh, manager Gabe Kapler predicted the Phils will make the playoffs this season, but that was only under the duress of his embarrassing start. GM Matt Klentak is the ultimate symbol of blind trust now required of fans. He has won nothing anywhere, refuses to make moves to unclog his lineup, and keeps crowing about the progress of his plan. Are the Phillies going to rejoin the haves in baseball anytime soon? Don’t rush them, please. That’s the message. And then there are the Flyers, whose GM Ron Hextall has become the alter-ego of the goalie he once was. Back in his playing days, Hextall was aggressive, crazed, desperate to win. All you need to know about Hextall the GM is that he employs a coach, Dave Hakstol, who should be in the cast of "The Walking Dead." These things take time, we keep hearing. Patience is a virtue. Blah, blah, blah. I just ran this column by my mother, who is still going strong at 96. She had an interesting theory about my lack of patience. Back then, doctors would give a little love tap to a baby at birth, to jump-start the little one. “Maybe he didn’t slap you hard enough,” she said. The boos that shook Citizens Bank Park last week were harsh and rude and relentless. And they were one more thing – effective. Bravo to the Phillies fans for doing what the supporters of all of our pro teams do so well, expressing emotion in a way that is clear and powerful. They wanted new manager Gabe Kapler to know that they didn’t like the way he was running their team, prioritizing statistical minutia over basic human logic. To his credit, Kapler embraced the fans rather than resisting them, and he survived his first major crisis with a newfound appreciation for our city. Whether he actually adjusted his philosophy to coincide more with the paying customers is a matter of conjecture. I say yes. The best example of Kapler’s revised thinking came with two outs in the seventh inning against Cincinnati in the final game of a 5-1 homestand last week. Nick Pivetta was on the mound, holding a 2-1 lead, having thrown 101 pitches – far more than the stat nerds would have preferred. Kapler spoke briefly to his young pitcher and then shocked everybody – including Pivetta – by leaving him in the game. The young pitcher got the third out, and the Phils went on to win. Afterwards, Kapler said, “That’s the gut that comes into this game” – meaning he dismissed analytics in favor of instinct. I asked him the next day if the fans had pushed him in that direction with their incessant howling during his first few games in Philadelphia, and he didn’t dismiss the theory. Instead, he said it was just a matter of time before he managed that way anyway. He also made an emphatic point that numbers – he prefers the term information now more than analytics – will always be an important factor in his decisions, but they will not dictate every move the way they appeared to during the 1-4 start. Since that horrid and alarming first week, the Phillies have been a lot more fun to watch, and a lot more successful. Much of the credit goes to the players (especially Kingery) and to the manager. But, in my book, it was the fans who set Gabe Kapler straight. The Flyers will not – I repeat, WILL NOT – beat the Penguins in the first round of their playoff series. What happened in the first game, a 7-0 blowout by Pittsburgh, exposed the fundamental flaw in these Flyers. They have a major problem with emotion. They rebounded with a rousing 5-1 rout of the two-time Stanley-Cup champions in the second game before collapsing again in game 3, illustrating clearly that they will not be able to match the energy and grit of the Penguins over a long series. In the most passionate sports city in America – see: Eagles and Sixers – the Flyers are flat-liners. Think about it. After a grueling season in which their playoff fate was in doubt right up to the 82nd game, the Flyers were dead on arrival in the most important contest of the season, the playoff opener. The captain, Claude Giroux, called it “one of the worst games I’ve been a part of.” What he failed to say is why. The answer is right there for every fan to see. How many times did the team start slow this season? How many times did they admit afterwards that they “came out flat”? How many times when they looked to their coach, Dave Hakstol, for leadership did they find nothing? Whether they want to admit it or not, the Flyers are not built to win the way the Eagles and the Sixers are right now. They don’t have passionate leaders like Carson Wentz and Joel Embiid. Giroux has had a terrific season and has led by example, but he is never going to rouse his teammates the way Bobby Clarke did. That’s why the Flyers need someone behind the bench who can inspire, not tire – someone who responds to challenges with more than a shrug and a grunt. GM Ron Hextall – an emotional leader himself in his playing days – is not very good at admitting mistakes, but he’s going to have to acknowledge a big one before the Flyers are truly a threat again. He’s going to have to find someone with a lot more life in him than Dave Hakstol. • The Eagles really had no choice but to release hometown kid Daryl Worley after he was arrested early Sunday morning for allegedly resisting arrest not far from the NovaCare complex. Acquired in the Torrey Smith trade, Worley grew up in Philadelphia, and he told me recently how much it meant for him to play here. What he didn’t grasp was that the Eagles are the champions. It is a privilege to play for them. He violated that privilege. So he’s gone. • Nick Foles has had a busy off-season since he won the Super Bowl. He visited Disney World, did a tour of the network talk shows, and now he’s writing a memoir due to be released in June. Foles has every right to make the most of his moment, and his admission over the weekend that he wants to be a starter again should give pause to those who feel he’ll be happy holding a clipboard behind Carson Wentz. Foles has had a taste of the national limelight. He wants more. It’s human nature. • Is there a sillier debate going on right now than the furor over whether Ben Simmons or Donovan Mitchell of Utah deserves the NBA rookie of the year? Even though Simmons is better in every major statistical category, Mitchell is arguing that his rival was with the Sixers last season – out with a foot injury – so the 6-10 point guard is not really a rookie. Mitchell has been wearing hoodies with the definition of a rookie on them. Yeah, that should do it. There’s no better way to sway the vote than with a hoodie campaign. • Where are all of those baseball geniuses who thought it was a great idea to send Scott Kingery down to the minor leagues until April 13th so the Phillies could get an extra year of service time? Before that benchmark arrived, the Phils found another way, signing the stud rookie to a long-term contract. How many more games would the Phillies have lost if Kingery hadn’t been there the past two weeks? I would pose that question to the geniuses, but they’re all in hiding right now. • Jay Wright is not only the best coach in Philadelphia – yes, including Doug Pederson – but he is also the nicest guy in sports. That’s why it was very alarming last week when word leaked out that the New York Knicks are going to try to lure Wright from Villanova with a big contract offer. The idea of Wright working with the biggest jerk in sports, Knicks owner James Dolan, is unimaginable. Just say no, Jay. Please.